Offering you a complete choice of products which include cork mobile holder, cork vertical magazine rack, cork multi utility pen stand sleek, cork desk top planner and cork large magazine stand. 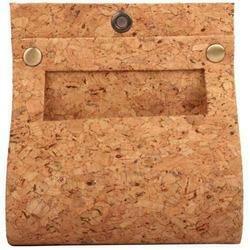 We have been counted as major firm offering beautifully designed Cork Mobile Holder. The wall hanging mobile holder is becoming the most preferred gift item in the marketplace as the product is light weight, eco friendly and comes with a beautiful and unique pattern that speaks matchlessness. Fabricated precisely by our expert craftsmen the handmade mobile holder is made from finest grade cork fabric which is procured from renowned sources. Further, the high quality mobile holder is accessible at a nominal price. 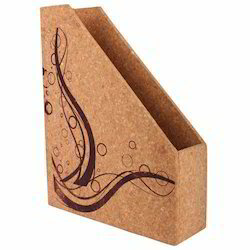 Our organization provides a wide range of Cork Vertical Magazine Rack. These products are manufactured using the best quality materials which are purchased from reputed vendors of the market under the supervision of the highly skilled professionals at well-equipped infrastructure set up. In addition to this, these products are available at reasonable rates in the market. 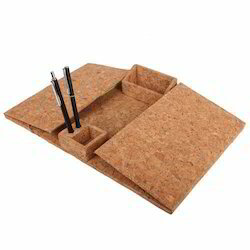 We have gained rich industry experience in this domain of in offering a wide range of Cork Multi Utility Pen Stand Sleek to our valued clients. These offered stands are quality tested on assorted standards of quality by quality checker team to assure that quality approved products delivered to our customers. Furthermore, offered range is available at reasonable prices. 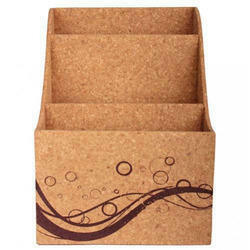 Our organization is among the reputed names in the market for providing a wide range of Cork Desk Top Planner. Our products are available in different sizes as per client’s requirements. These products are mainly used in offices. In order to ensure the quality, the offered product is checked against different quality parameters. Also, these products are offered to the clients at very reasonable rates. 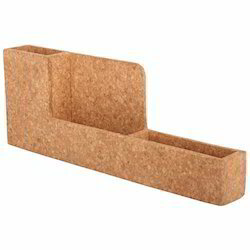 Looking for Cork Stationery Desktop ?